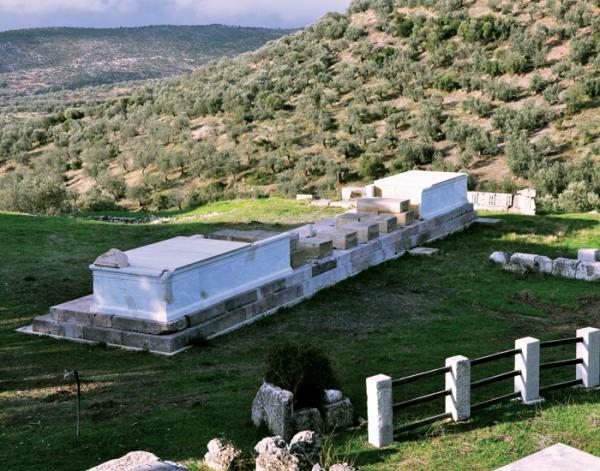 The Temple of Apollo Maleatas: In the 2nd millennium BC, on the Kynortion Mountain, behind the theatre, a grand Mycenaean temple was constructed, comprising an open-air altar and an open-air space for ritual dinners. It was dedicated to Apollo Maleatas, a god with healing powers and allegedly the father of Asklepios. From the 6th century BC onwards, this temple formed a unity with the Asklepieio, which was constructed at that time. During the Classical era, the main monuments of the temple were the god’s temple and altar, the Temenos (temple) of the Muses, the little temple of Asklepios, and a covered gallery constructed on a monumental embankment; also, the big water-tank of the Roman era, the nymphaeum and a large dwell for the priests.